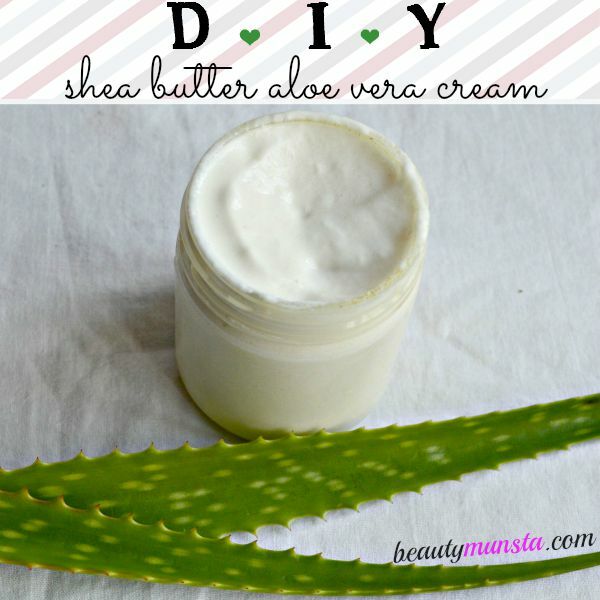 DIY Whipped Shea Butter and Aloe Vera Cream - beautymunsta - free natural beauty hacks and more! 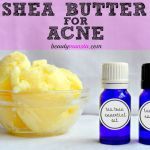 Aloe vera gel is my current obssession and I’m really excited to share with you this whipped shea butter and aloe vera cream recipe that also contains my favorite hydrosol and essential oil – ROSE! If you’re a regular reader of this blog, you’ll know that anything rose-scented just tickles my fancy! Aloe vera gel is a great sealant which locks moisture into dry skin/hair. It’s also soothing and cooling and can be used on inflamed skin. Combined with shea butter, aloe vera forms a non-greasy and healing mixture, that is also nourishing, to promote beautiful skin and hair. 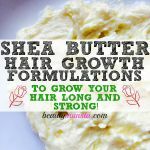 ➝ Shea Butter – Rich in Vitamins A, E, K and F, shea butter is one of the most nutritious skin and hair foods out there! It is intensely moisturizing and extremely good for dry and itchy skin/scalps. Read more beauty benefits of shea butter here. 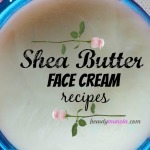 You can find 15 amazing skin benefits of shea butter here. ➝ Aloe Vera Gel – Aloe vera gel cuts down any greasiness in this whipped shea butter and aloe vera cream recipe and it also helps balance the skin’s pH due to its alkalizing properties. It also protects the skin’s outer layer from pollutants and germs. ➝ Rose Water – Rose water is refreshing, cooling, soothing and mega rich in Vitamin C which fights premature wrinkles as well as boosts collagen. It also makes this shea butter and aloe vera cream smell oh-so-amazingggg. ➝ Argan Oil – Argan oil comes from Morocco, where for centuries, people have been using it for various beauty benefits including to nourish skin and hair, treat rashes, for wound healing, soothe bug bites and infections and so much more! Argan oil boosts the healing and moisturizing properties of this whipped shea butter and aloe vera cream recipe. ➝ Rose Essential Oil – It scent is exotic and romantic but that’s not all rose essential oil is good for! It’s incredibly rich in Vitamin C and other nutrients that make it one of the best essential oils for aging skin! ➝ Vitamin E Oil – Vitamin E oil is great for preventing premature aging and it also helps lengthen the shelf life of this whipped shea butter and aloe vera cream since it is a powerful antioxidant. 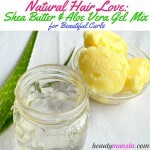 A simple whipped shea butter and aloe vera cream recipe for smooth, soft and supple skin! You can use it to moisturize hair as well! Scoop out the shea butter and place it in a medium sized mixing bowl. If your shea butter is hard, soften it using a double boiler. Whip it with a hand mixer or egg beater for a minute till its smooth and fluffy. Add the aloe vera gel and whip again till mixed. While whipping, slowly add the rose water little by little till fully incorporated. Finally, add the argan oil, vitamin E oil, rose essential oil and blend the mixture into a soft cream for about 7-10 minutes, then place it in the refrigerator for 15 minutes then take it out and whip again for 10 minutes. Your whipped shea butter and aloe vera cream is ready! Spoon it into a clean jar – any will do as long as its sterilized, and store in a clean dry place. Apply liberally on your face, neck, hands and whole body. You can also use it to seal moisture into your beautiful hair! If you want to buy organic non GMO and skin and hair friendly ingredients, just click on the links below. As you may already know, I buy East shea butter (Ugandan) and I love it for its softness, non-greasiness and slightly nutty & pleasant scent, but you could use West shea butter and it will work fine – however, you must soften it using a double boiler to make it easier to mix (since the raw form is hard). Lavender Essential Oil – Soothing and calming, to me, lavender essential oil is one of the best essential oils to mix with shea butter. Frankincense Essential Oil – Frankincense essential oil is very VERY good for scar fading and treatment and when combined with stretch mark erasing shea butter, it creates a powerful anti-scar formulation. Ylang Ylang Essential Oil – Originating from Indonesia and the Phillipines, this essential oil has a mysterious and exotic scent and it is known to be a powerful aphrodisiac. 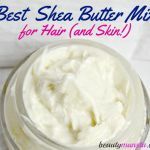 For more essential oils that mix well with shea butter, read my list of best essential oils for shea butter!